Ocular dirofilariasis is a zoonotic filariasis caused by nematode worm,Dirofilaria. We present a case of dirofilariasis affecting the upper eyelid in a 2-year-old child presenting as an acutely inflammed cyst, from southern Indian state of Kerala. Live adult worm was surgically removed and confirmed to be Dirofilaria repens. Live worm showing continuous movement was seen on the pre-operative high-resolution ultrasound. Ultrasound can be helpful in pre-operative identification of live worm.Imaging findings reported in literature are very few. We describe the clinical, ultrasound, and magnetic resonance imaging (MRI) findings. Ocular dirofilariasisis a zoonotic filariasis caused by nematode worm, Dilofilaria, transmitted to humans by the bite of Aedes, Culex,or Anopheles mosquitoes. Eye involvement may be periocular, sub-conjunctival, sub-tenon, or intraocular. The species Dirofilaria repens is endemic in southern-middle Europe and in some parts of Asia and Africa. There are very few reports of imaging findings in literature. We describe the clinical, ultrasound, and Magnetic resonance imaging (MRI) features. A 2-year-old female child presented with acute onset of periorbital edema in right eye. She was initially diagnosed as preseptal cellulitis and treated with systemic antibiotics. There was mild resolution of edema, but a cystic swelling was apparent in the right upper eyelid. Ultrasound was performed with high-resolution probe (8MHz) and showed a well-defined cyst approximately 2.5×1.5 cm in the lateral part of right upper eyelid. 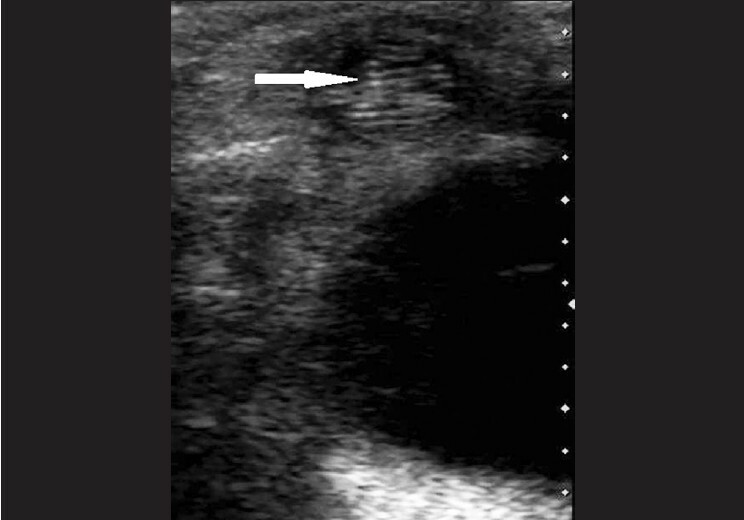 The cyst showed within it a coiled structure with parallel echogenic walls [Figure 1]. It showed continuous movement which represents the live worm. MRI was done to know any deep intraorbital extension and exclude other intraorbital abnormalities. 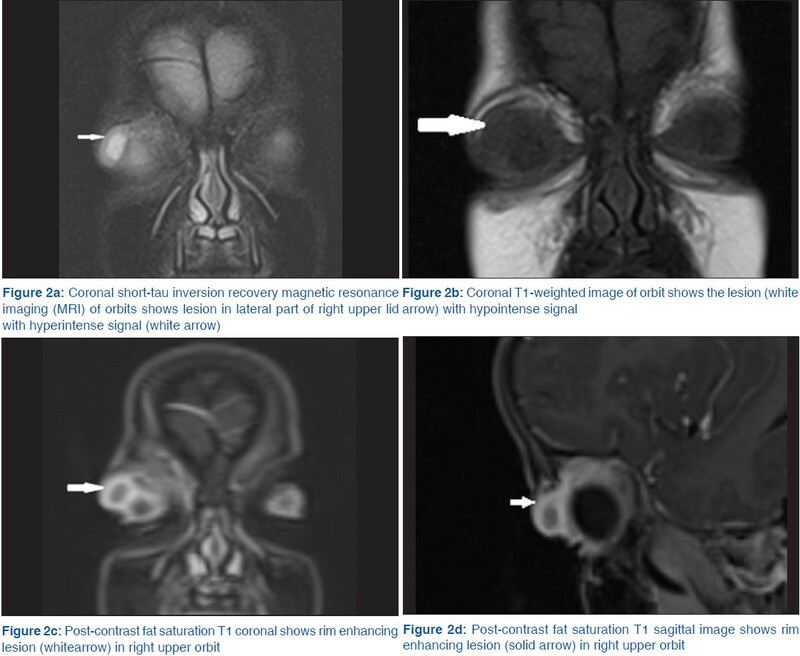 MRI of orbits showed a cyst in the lateral part of upper eyelid which showed hyperintense signal on coronal short-tau inversion recovery image [Figure 2]a, hypointense signal on coronal T1 image [Figure 2]b and revealed rim enhancement on post-contrast T1-weighted fat saturated images [[Figure 2]c (coronal) and d (sagittal)]. The cyst was confined to the upper lid. Ill-defined intermediate signal intensity was seen on STIR images [Figure 2]a within the cyst which may represent the worm. Surgical excision of the parasitic cyst was done through an upper lid crease incision. The cyst was adherent to the levator palpebrae superioris muscle. It contained a live motile worm measuring about 9 cm in length [Figure 3]. Histopathological examination [Figure 4] showed a worm with thick cuticle, muscle coat, longitudinal and transverse striations and double uterus. Based on histopathological appearance, the worm was identified as D.repens. Post-operatively, the child was asymptomatic except for a mild residual ptosis which was improving. Ocular dirofilariasisis is a zoonotic filariasis caused by nematode worm, Dilofilaria. It is transmitted to humans by the bite of Aedes, Culex, or Anopheles mosquitoes. Dogs are main source of infection and humans are accidental hosts. Clinically, ocular involvement may be periorbital,  sub-conjuctival, , sub-tenon,  and intraocular. Apart from ocular involvement, subcutaneous  and pulmonary manifestations  can also occur. MRI findings have been described in a single case  and include the visualization of an enhancing thick-walled, semiliquid structure with a discrete, tubular, central signal, representing the worm on T1-weighted images. In our case, high-resolution ultrasound (8MHz) showed a well-defined cyst in upper eye lid with a coiled structure showing parallel echogenic walls. It showed continuous movement. MRI was also done in our case to look for any deep extension and assess other intraorbital structures. MRI showed a well-defined cyst in lateral part of upper eyelid.Rim enhancement was seen on post-contrast T1-weighted fat saturated images, which represents surrounding inflamed tissue. The cyst was within upper eye lid and rest of the orbit was normal. Ill-defined intermediate signal intensities were seen on STIR images which may represent the worm. The definitive visualization of worm was, however, done on ultrasound. MRI mainly showed the inflamed cyst. It excluded deep extension and other conditions such as inflammatory pseudo tumor and lacrimal gland tumor. This is a report of a case of periorbital type of ocular dirofilariasis. Ultrasound can be used as a non-invasive diagnostic tool to identify live adult worm and may help in pre-operative diagnosis. Pampiglione S, Canestri Trotti G, Rivasi F. Human dirofilariasis due to Dirofilaria (Nochtiella) repens: A review of world literature. Parassitologia 1995;37:149-93. Sekhar HS, Srinivasa H, Batru RR, Mathai E, Shariff S, Macaden RS. Human ocular dirofilariasis in Kerala Southern India. Indian J Pathol Microbiol 2000;43:77-9. Nadgir S, Tallur SS, Mangoli V, Halesh LH, Krishna BV. Subconjunctival dirofilariasis in India. Southeast Asian J Trop Med Public Health 2001;32:244-6. Sathyan P, Manikandan P, Bhaskar M, Padma S, Singh G, Appalaraju B. Subtenons infection by Dirofilaria repens. Indian J Med Microbiol 2006;24:61-2. Nath R, Gogoi R, Bordoloi N, Gogoi T. Ocular dirofilariasis. Indian J Pathol Microbiol 2010;53:157-9. Gautam V, Rustagi IM, Singh S, Arora DR. Subconjunctival infection with Dirofilaria repens. Jpn J Infect Dis 2002;55:47-8. Badhe BP, Sane SY. Human pulmonary dirofilariasis in India: A case report. J Trop Med Hyg 1989;92:425-6. Jariya P, Sucharit S. Dirofilaria repens from the eyelid of a woman in Thailand. Am J Trop Med Hyg 1983;32:1456-7. Mittal M, Sathish KR, Bhatia PG, Chidamber BS. Ocular dirofilariasis in Dubai, UAE. Indian J Ophthalmol 2008;56:325-6. Beaver PC. Intraocular filariasis: A brief review. Am J Trop Med Hyg 1989;40:40-5. Logar J, Novsak V, Rakovec S, Stanisa O. Subcutaneous infection caused by Dirofilaria repens imported to Slovenia. J Infect 2001;42:72-4. Hirano H, Kizaki T, Sashikata T, Matsumura T. Pulmonary dirofilariasis - Clinicopathological study. Kobe J Med Sci 2002;48:79-86. Smitha M, Rajendran VR, Devarajan E, Anitha PM. Case report: Orbital dirofilariasis. Indian J Radiol Imaging 2008;18:60-2. Groell R, Ranner G, Uggowitzer MM, Braun H. Orbital dirofilariasis: MR findings. AJNR Am J Neuroradiol 1999;20:285-6. Authors of Document Wiwanitkit, S., Wiwanitkit, V.